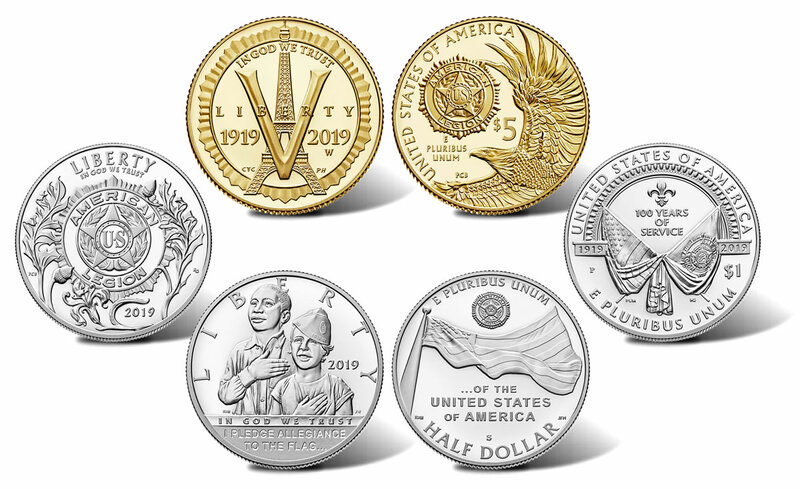 Seven new products launched today as part of the United States Mint’s 2019 American Legion 100th Anniversary Commemorative Coin Program. 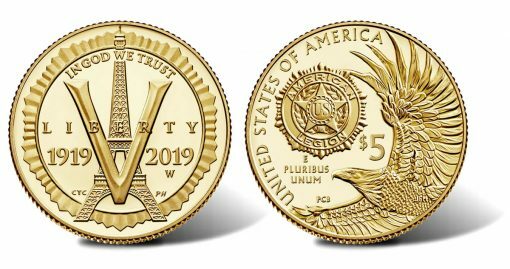 Options include $5 gold coins, silver dollars and clad half-dollars in proof and uncirculated collector finishes and a three-coin proof set holding one of each denomination. All are issued under the American Legion 100th Anniversary Commemorative Coin Act (Public Law 115-65) to recognize the American Legion’s centennial. The Legion (www.legion.org) was founded March 15, 1919, in Paris, France, out of concern for the welfare of soldiers and the communities they returned to in the United States after World War I. Charted by Congress later that year as a patriotic organization for veterans, the Legion quickly grew into one of the largest veteran’s service organization in the United States. Final designs for the commemorative coins were selected from 63 candidates after consulting with the Adjutant of The American Legion, the Commission of Fine Arts (CFA), and the Citizens Commemorative Coin Advisory Committee (CCAC). 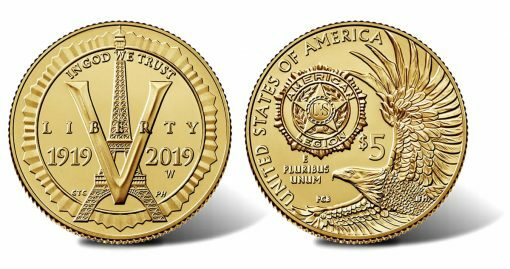 Appearing on the $5 gold coin obverse (heads side) is an image marking the inception of the American Legion and its mission to serve America and its war veterans. It includes an outer geometric rim design from the American Legion emblem, the Eiffel Tower, and V for victory. Inscriptions read "IN GOD WE TRUST," "LIBERTY," "1919," and "2019." Chris Costello designed the image and Phebe Hemphill sculpted it. On the reverse (tails side), we find a soaring eagle, symbolizing the United States. The American Legion emblem is above the eagle. Inscriptions read "UNITED STATES OF AMERICA," "$5," and "E PLURIBUS UNUM." Paul C. Balan designed the reverse and Joseph Menna sculpted it. For the silver dollar obverse, an American Legion emblem adorned by oak leaves and a lily is shown. Inscriptions include "LIBERTY," "IN GOD WE TRUST," and "2019" with Paul C. Balan designing and Renata Gordon sculpting. The silver dollars’ reverse represents the founding of the American Legion in Paris in 1919 with crossed American and American Legion flags. A fleur-de-lis is above with the inscription "100 Years of Service." Additional inscriptions read "UNITED STATES OF AMERICA," "1919," "2019," "$1," and "E PLURIBUS UNUM." Patricia Lucas-Morris designed the reverse and Michael Gaudioso sculpted it. 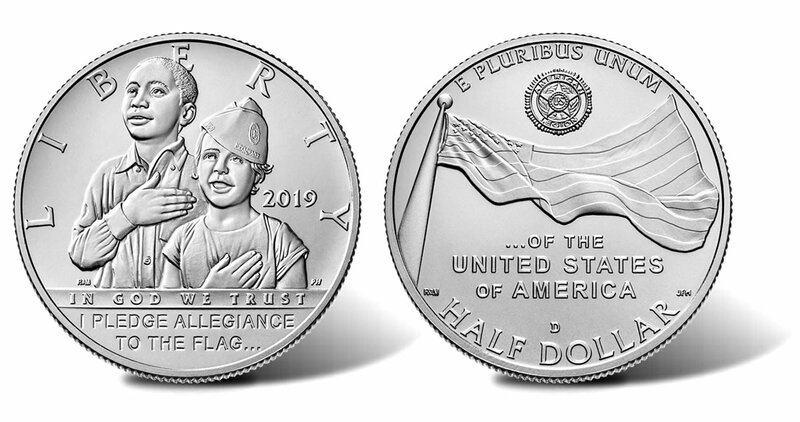 Found on clad half dollar obverses is a design depicting two children standing and reciting the Pledge of Allegiance. The little girl is shown wearing what is said to be her grandfather’s old American Legion hat. 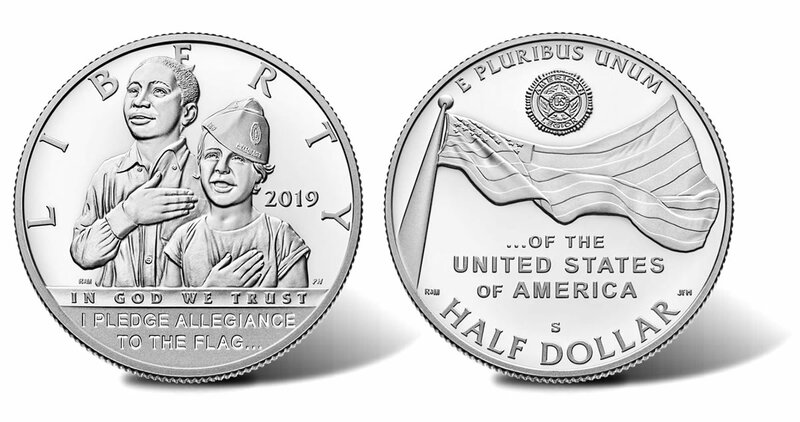 Inscriptions include "LIBERTY," "2019," "IN GOD WE TRUST," and "I PLEDGE ALLEGIANCE TO THE FLAG…" Richard Masters designed the obverse and Phebe Hemphill sculpted it. Each reverse design shows an American Flag flying in the air with continuing pledge of allegiance inscriptions: "…OF THE UNITED STATES OF AMERICA." Other inscriptions include "E PLURIBUS UNUM and "HALF DOLLAR." Richard Masters also designed the reverse. Joseph Menna sculpted it. *Gold coin prices are set according to the Mint’s pricing matrix. They can change weekly based on market fluctuations. **Regular pricing goes into effect on April 15, 2019 at 3 p.m. EST. 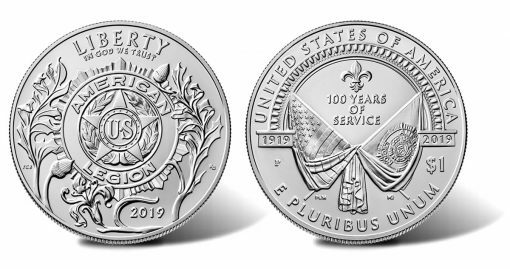 American Legion 100th Anniversary Coins are available from the U.S. Mint’s online store for commemorative products, or by calling 1-800-USA-MINT (872-6468). 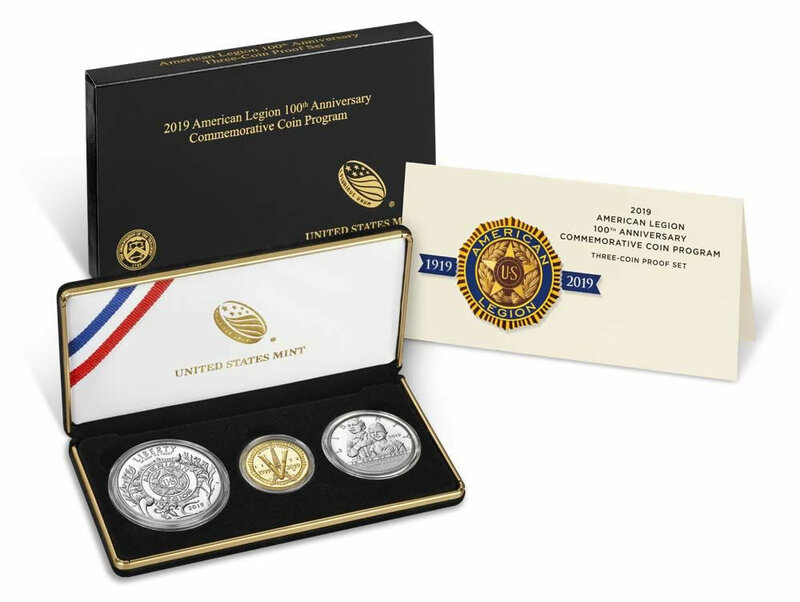 U.S. Mint image of its American Legion 100th Anniversary 2019 Three-Coin Proof Set. The set includes a proof edition of each commemorative coin. Surcharges of $35 for each gold coin, $10 per silver dollar and $5 for each clad half-dollar are included in the prices. These surcharges, provided the coins turn a profit, will be paid to the American Legion to support the Legion’s programs for veterans, members of the Armed Forces, and other purposes specified by the authorizing legislation. I have to admit, I thought the Three-Coin Set would have Sold Out. FYI–> No chance of any sell out on this item EVER… USM makes too many military commems in general & this is a rehash mostly of US Marsh*ll designs. The price is also so far out of whack from spot/reality that there is no chance of a non collector buying on spec. Last, the minage # are just CRAZY 50,000 gold so a 7,500 UNIT limit is only illusory…Silver $1 400,000 & @ price @ more than 3x face, why wold it be a hot seller???????? Sorry I’m jaded an ex mintaholic now freed! On 2nd thought it may sell out @ 7,5oo when limits lifted, why & buy WHO is a big ? No Flipper object here!! With intro pricing for the dollar at $39 above spot price which is insane for a modern coin. Once the intro pricing is dropped it goes to basically $60 or $45 above spot. They won’t be rare so no numismatic value to them and too outrageously priced to own just for the bullion. As a veteran I am glad the American Legion is getting recognized but can’t see myself owning these coins. The half dollar design is the standard US Mint horrible and at $26 for thirty cents worth of metal – they must think we are idiots. I will stick to the older coins and leave the modern commemoratives to big companies to buy/sell/trade and then crack out and melt for bullion. Neat, but I’m still pretty disappointed the mint isn’t going to produce a commemorative this year for the 150th Anniversary of the driving of the Golden Spike at Promontory, completing the first transcontinental railroad. They did do Apollo’s 50th, though. I agree totally with both of your suggestions. We need silver commemorative half dollars. And I am tired at trying to look at the edge of a coin in a sealed holder to check on the date & Mint mark! I bought the 2 half dollars since I’m working on completing a full set of the modern commemorative half dollars. I like the new dollars, but I’ll have to wait a little while to get them. I think they did a good job on these. Just a follow-up to my earlier post regarding the finish on the rocketship Kennedy, the press releases have only described it as ” an uncirculated 2019D Kennedy”. Another source said it was a “special” coin…?